Environmentalists say Bay Area regulators are continuing to drag their feet on dealing with air pollution from refineries. And residents in vulnerable communities are paying the price. Andres Soto of CBE says regulators must do more. For years, a coalition of environmental and community organizations has been pushing local regulators to take stronger steps to reduce pollution from the Bay Area’s five oil refineries. 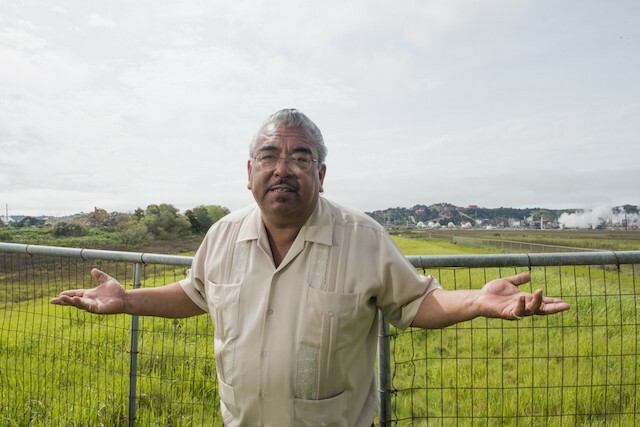 At last month’s Bay Area Air Quality Management District board meeting, speaker after speaker took an openly accusatory tone. Andres Soto, organizer with Communities for a Better Environment, or CBE, accused the district staff of “colluding, cooperating, and bending over” for the oil industry. And Ken Jones of 350 Marin pointedly told the board, “You need to look at new leadership,” alluding to Jack Broadbent, the district’s air pollution control officer, who heads the staff. One source of this anger was the air district’s recent permit allowing the Phillips 66 refinery in Rodeo to increase the amount of oil processed in its “hydrocracker” by 4,000 barrels a day. Because the hydrocracker is used to process very “heavy” oil, environmentalists contend that this is part of a long-range plan to import more heavy, extra-polluting oil from Canada’s tar sands. At the meeting, district staff passed out a “fact sheet” denying this charge, but activists are convinced that “the latest rubber-stamped permit is a stepping stone to tar sands,” said Rodeo neighborhood activist Nancy Rieser. She pointed to two other projects for which the refinery is seeking permits: expansion of its capacity to store propane (a byproduct produced in greater quantities by refining heavy oil) and almost tripling the number of oil tankers coming to its marine terminal. “You say this permit is not related to the wharf expansion,” Rieser said, “but it’s your responsibility to look at the larger picture.” She and other activists accuse Phillips 66 of “piecemealing” its preparations for tar sands refining — getting permits for one small piece at a time to avoid public scrutiny. Isabella Zizzi of the indigenous group Idle No More, said it was “very shocking” that the permit was issued at the same time a delegation from the air district, including Broadbent and board member John Gioia, were visiting Canada. They went to see the tar sands extraction and meet with representatives of First Nations battling a proposed pipeline to bring tar sands through their land to the Pacific Coast. Gioia, a Contra Costa County supervisor who represents Richmond, said later in an interview that the trip “allowed me to see the strong connections between tar sands, the pipeline, the impact on fenceline communities here, and our global fight against climate change.” The Transmountain Pipeline, if completed, would “open up the third largest oil reserve in the world to a larger market. It would be a disincentive to investments in clean renewable technology and disastrous for our fight against global warming,” he said. Broadbent responded to anger over the new permit by saying that regulations left the staff no leeway but to approve Phillips 66’s request. “If they comply with all the requirements, we have to issue the permit,” he said. In an email, the air district staffers explained that the pollution resulting from the increased production would be within limits already permitted. In an interview later, Greg Karras, senior scientist at CBE and one of the region’s leading experts on refinery activities, noted that environmentalists have been pushing for a rule to ban further increases in refinery pollution. But the air district has yet to adopt such a rule. If it had, Karras said, the Phillips 66 permit would have been denied. Six years ago, the air district published a report identifying particulate matter, or PM, as “the air pollutant that poses by far the greatest health risk to Bay Area residents.” These microscopic particles travel deep into the lungs, through the bloodstream, and into every cell in the body. In other words, the stuff kills people. Two years later, in December 2016, the board passed that rule, Rule 6-5. Three refineries immediately sued. In March 2017, air district signed an agreement with the refineries to win a temporary halt to the lawsuit. Through a freedom-of-information request, CBE recently acquired a copy of the settlement document. In it, the air district promised to propose certain amendments to the rule. A year and a half later, this August, the staff presented this amended rule to the board. Later, Gioia added, “the refineries have sued on every one” of the air district’s recent regulations. And even the amended rule to control particulate matter will probably not be enacted until early 2019, according to Guy Gimlen, the air district’s head of rules and strategic policy. Gathering public comment, drafting an environmental impact review, allowing time for public comment on that, then revising the rule will take until mid-December. Meanwhile, the district is using a new law meant to promote environmental justice as an excuse to delay further action on particulate matter, environmentalists charge. The 2017 state law, known as AB 617, tells regional air districts to develop plans to clean the air in heavily polluted communities, like those near the refineries. At the Sept. 5 air district meeting, staff members said that in December they would present a schedule for studying and implementing this law, which they estimated would take until 2021. At a later meeting, the California Air Resources Board passed a resolution, initiated by Gioia, calling on the air district to “expedite” this schedule and complete new rules for reducing refinery pollution by the end of 2020. Environmentalists say the district is also using another 2017 law, AB 398, as an excuse to back down on its commitment to cut greenhouse gas emissions from refineries. AB 398 bars regional air districts from making rules to reduce greenhouse gas emissions from sources like refineries. As a result, the air district announced it was suspending its plan to bar refineries from increasing their releases of carbon dioxide. Climate activists say suspending this plan is unnecessary, arguing that the law doesn’t ban a “cap,” only reductions. This report originally appeared in our sister publication, The East Bay Monthly. After withdrawal of a 2018 proposal to regulate the dirty fuel, city councilmember proposes an eventual export ban.